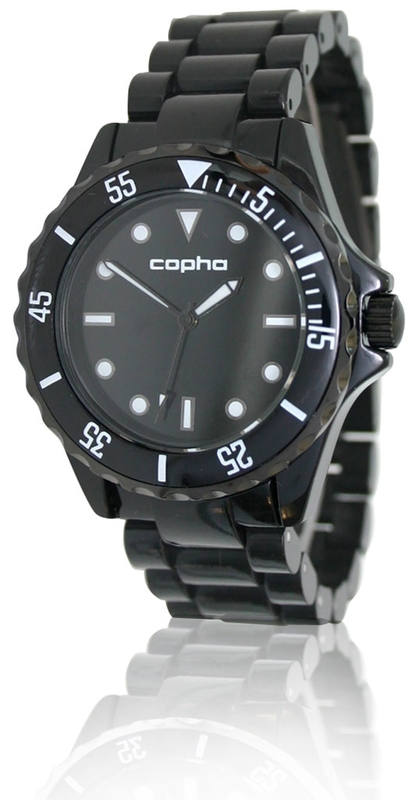 Copha Swagger - All Black The Swagger of the Danish Copha watch brand is a fashionable watch. Available in various colors and is wearing by both men vrouwen.Uurwerk: Japanese Quartz movement produced by Citizen MiyotaKast: Plastic with a stainless steel back Dial: Black dial with white hands and black second wijzer.Glas: Mineral Glass Waterproof: 5 ATM . Suitable for swimming but not to participate duiken.Band: Black plastic links, which are adjustable. The watch comes with additional links. The butterfly clasp is made of stainless steel in black. Garantiebewijs.Indien Watch comes with the watch is not in stock, it may be ordered. Delivery 10 days, if in stock at the supplier.